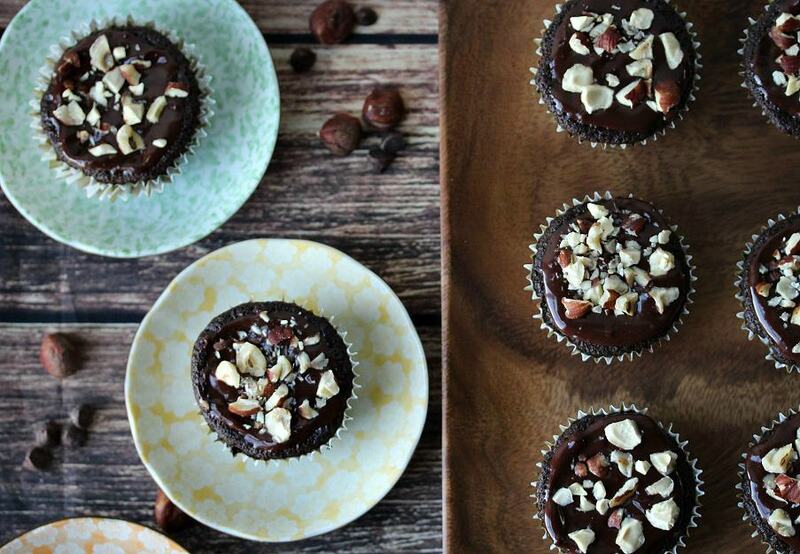 These Gluten Free Chocolate Hazelnut Cupcakes are super moist and super delicious! Everyone will love them! I’ve been playing around with different gluten free flour blends lately. 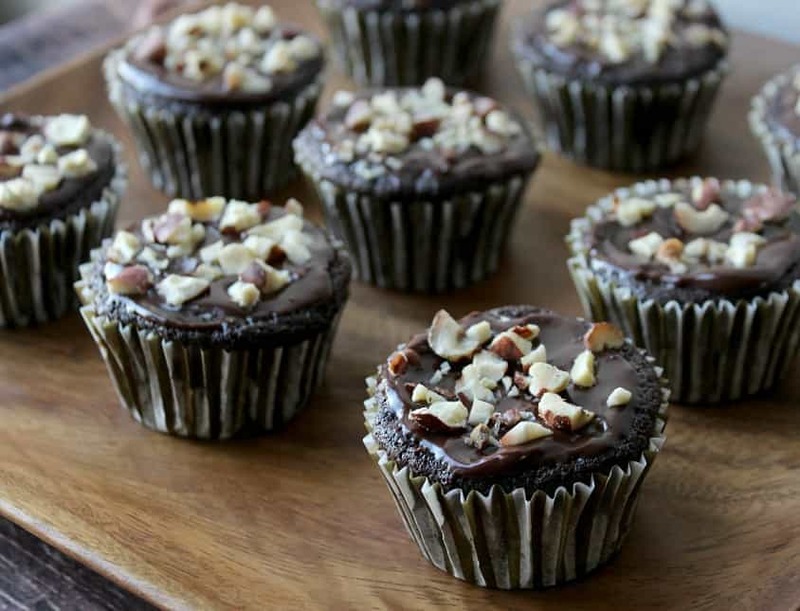 I don’t feel like I’ve perfected it quite yet, but the result I got using a combination of coconut flour and tapioca flour with these Gluten Free Chocolate Hazelnut Cupcakes was too good to not share right away! I love the combination of chocolate and hazelnut. I can eat Nutella by the jar spoonful! I made a non-gluten free version of these cupcakes not too long ago and had to have others taste test them for me, as I am avoiding gluten at the moment. They gave them rave reviews, so I had to come up with a version I could eat too! 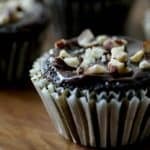 My fiance and my son both told me that my Gluten Free Chocolate Hazelnut Cupcakes are just as good as my regular Chocolate Hazelnut Cupcakes! It’s only been a few weeks that I’ve cut out gluten so I’m pretty sure I can say these are pretty darn close to the original! 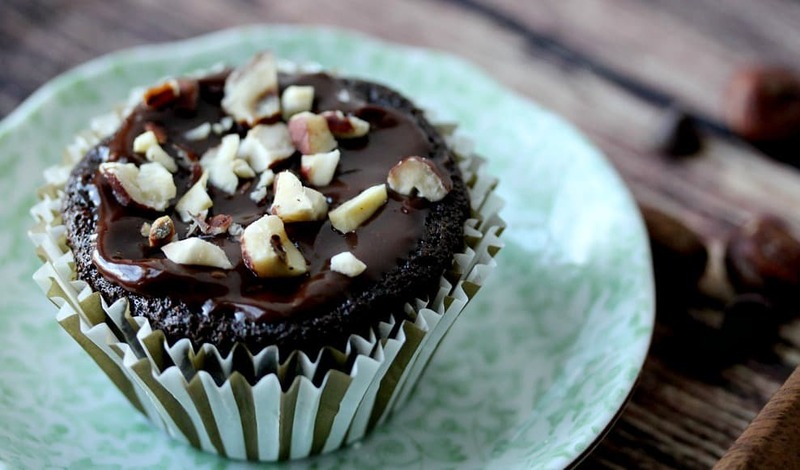 I topped these cupcakes with an easy-to-make chocolate ganache icing and chopped hazelnuts. Ganache is fun to use, because it not only tastes really decadent, but you can use it in different ways. You could dip the cupcakes in the ganache while it’s warm, or wait until it cools a little and spread it on (my favorite method), or whip it until it’s fluffier. I know a lot of you are gluten free, or you cook for people who are gluten free. One little trick I do when I have to make both gluten free and regular versions of the same food, is use different colored containers, different plates, or different designed cupcake wrappers. You can also use little food flags to mark the gluten free dishes! It has really helped everyone to know what they can and can’t have! I am trying to share more recipes that are gluten free, yet nearly identical to their non-gluten free counterparts! If there are any gluten free recipes that you would like to see on here, let me know in the comments! 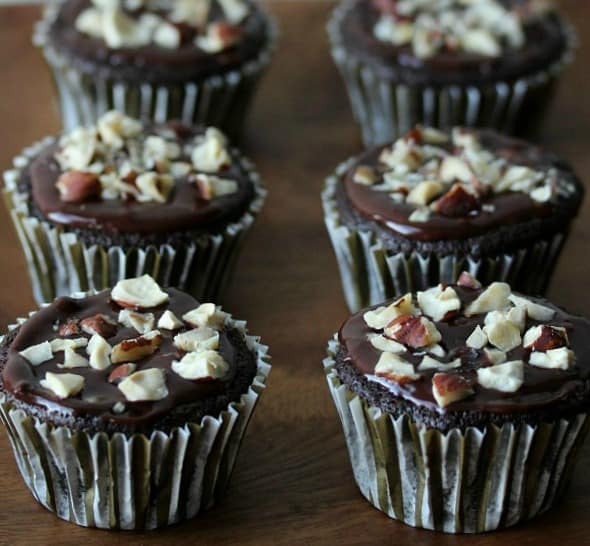 These Gluten Free Chocolate Hazelnut Cupcakes are super moist and super delicious! Preheat oven to 350° F. In a small bowl mix together both of the flours, baking soda, baking powder, salt, and cocoa powder. Set aside. In a mixing bowl, beat the butter and sugar on medium speed. Add the eggs in one at a time, then add the vanilla extract, hazelnut extract, and milk. Gradually add the flour mixture until everything is well combined. Line a cupcake pan with cupcake wrappers. Fill each about 2/3 of the way full. Bake approximately 18 minutes or until a toothpick inserted into the center comes out clean. For the ganache icing, place the chocolate chips into a medium mixing bowl. Heat the heavy cream in a saucepan until just about boiling. Slowly pour over the chocolate chips and mix until the chips are all melted and everything is blended and smooth. Once the cupcakes are cooled you can either dip them into the warm ganache and then top with the hazelnuts, or you can let the ganache cool and thicken and then pipe or spread it onto the cupcakes and top with hazelnuts. These little cupcakes look delicious. I am not gluten free, but good food is good food, darnit… and this passes the test. I love chocolate and hazelnut together! These look amazing! I really hope your family and friends know how lucky they are to be able to eat these fabulous treats you make I really love your recipes and these are on top of my list to make! Glad to have a GF recipe for chocolate cupcakes. My GF friends will be excited to try this!